After a massive earthquake hit Ecuador's coast in 2017, our pastor in Loja encouraged our congregation to think of ways to help with relief efforts long-term rather than simply meeting immediate needs. SIM Ecuador, working alongside churches in Loja, has developed a project to minister to people in coastal areas who were significantly impacted by the earthquake. 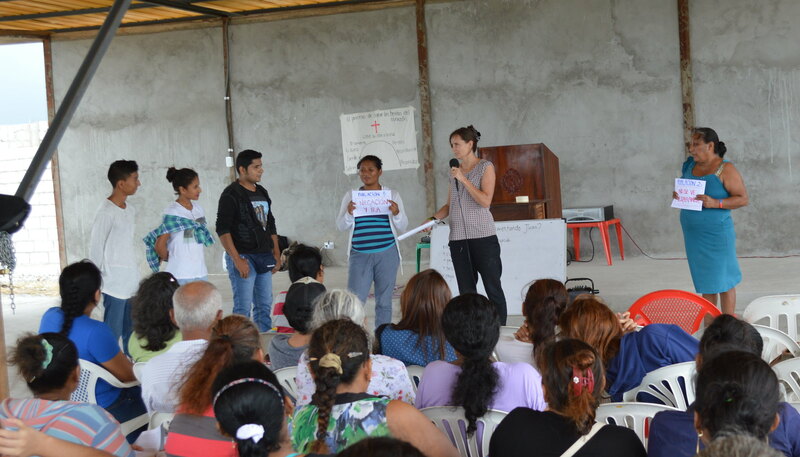 A year after the disaster we took our fourth trip to the coast--this time offering a trauma healing course at a partner church in Pedernales. We wanted to help this congregation heal from the grief and loss caused by the earthquake, and we also hoped to give them tools to minister within their families and community. Stacey Conard, SIM’s trauma healing coordinator, explains that trauma healing is a ministry which equips people and churches to care for those suffering with severe wounds of the heart and spirit. Often the ones who need healing are survivors of conflict, disaster or abuse. Sometimes Christians don't know exactly how to deal with the extreme pain and sorrow of other people. Instead of listening and walking alongside those who are suffering, well-meaning believers may avoid any discussion of lost loved ones or past events altogether--or worse, push a grieving person to “move on" before he or she is ready. Even church members and pastors may confuse the normal emotions of anger, denial, anxiety or doubt as "sin." Unhealed grief often carries its own brand of shame, and shame pressures a person to hide from others and from God. But trauma healing works together with churches in communities, equipping them to become sanctuaries of hope and healing to those around them and bringing people together. SIM’s vision is to see Christ preached where He is least known, disciples of Jesus expressing God’s love in their communities, and Christ-centred churches planted around the world. In the wake of devastation like the 2017 earthquake, SIM Ecuador has partnered with local churches to show God’s love and compassion through home construction, trauma healing ministry, and by simply listening to and caring for grieving survivors, We demonstrate clearly that the Jesus of the Bible tenderly cares for the whole spectrum of people's needs, including physical, emotional and spiritual. Before the trip to Pedernales, Michael and Kelly Reeves and I led a group of about thirteen people from our church through a trauma healing course called "Healing the wounds of the heart." After we completed the training, we asked the group to present the course material to the church in Pedernales, including a special programme for children. About fifty people and fifty children attended our presentation the first afternoon, and forty people and a whopping seventy children came for the second afternoon’s programme. One lady named Paola came to the presentation with a neighbor who attends the church. Paola participated in the course, and afterward said she felt that "every word was spoken specifically for her"--and that the material was just what she needed. She had such a positive experience with the church that she wanted to come back! What a joy to hear how God used this special trauma healing team to reach someone with a wounded heart for Christ. Pray for the small community of Playita de Coaque where we have previously constructed several houses. The area remains in need of more permanent housing for families still living in temporary shelters.